In this video, we will discuss generating FormGroups and FormControls dynamically at runtime. Here is what we want to do. Every time we click "Add Skill" button we want to generate another set of skill related form controls (i.e Skill, Experience & Proficiency). This is continuation to our previous video, Part 20. 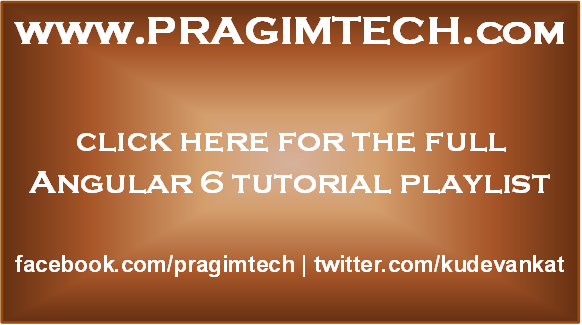 Please watch Part 20 from Angular 6 tutorial before proceeding. Place the following HTML inside the <div> element with class well. Notice the click event is bound to addSkillButtonClick() method. We will create this method in the component class next. From the root FormGroup "employeeForm" get a reference to the skills FormArray. 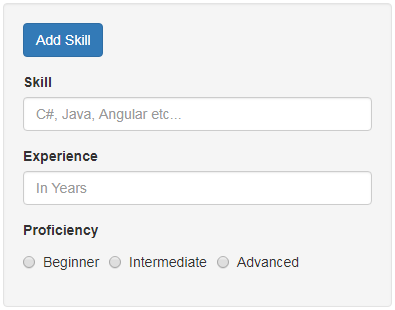 Notice we have passed the name of the FormArray (skills) as a parameter to the get() method. The get() method returns the FormArray as an AbstractControl. We know it's a FormArray so we are type casting it to FormArray. Step 3 : Loop over "skills" FormArray to dynamically generate the HTML input elements. The dynamically generated HTML input elements have the same id. For example, all the "skillName" textboxes have the same id "skillName". Not only the id, even the for attribute value of the labels is also the same. As a result when we click on a label of an input element, the wrong textbox receives focus. Also, the validation is broken. We will discuss fixing these issues in our next upcoming videos. Cross-Origin Request Blocked: The Same Origin Policy disallows reading the remote resource at http://localhost:54074/api/values/?id=1. (Reason: CORS request did not succeed). Please use the CORS extension for time being.You can find the CORS extension in google chrome extensions.It's related to cross origin problem not issue with your code.